#3 How a Stun Gun Affects the Human Body? #5 How to Use Your Stun Gun Effectively? Although stun guns are one of the most popular self-defense items, not many people know how they work and how they can be used properly. If you’re one of these people, don’t worry! We’ve got you covered. 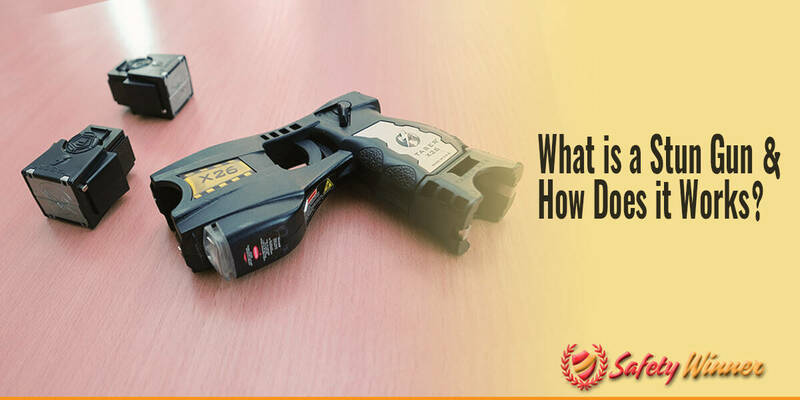 Continue reading to learn what a stun gun is, as well how it works! In order to understand what a stun gun is and how it works, we’re going to give you a quick lowdown of the history of stun guns. While you might think stun guns were only made recently, their history dates back to the 1700s. Yup, that’s right. Over three hundred years ago, Leyden jars were used as a form of stun guns. Basically, the jars built up static, which would create an electric charge. The next form of a stun gun was a cattle prod, which produced non-fatal electric shocks meant for cattle. Although Leyden jars and cattle prods were used for hundreds of years, the closest thing to a modern-day stun gun was created sometime during the 1930s. Still, it took approximately three decades for this idea to catch on. Therefore, the modern-day idea of a stun gun was created in the 1960s. It’s interesting to note that the modern-day stun gun was created for air marshals to use to restrain criminals during flights. Of course, the intended use has broadened as everyday civilians mostly use stun guns. So, what exactly is a stun gun? Well, a stun gun is first and foremost an item used for self-defense. It’s important to note that a stun gun is not a weapon and will not seriously harm or debilitate your target. Basically, a stun gun uses electric currents known as volts to surge through its foundation and out a pronged tip to send electric volts through a target’s muscles. In other words, a stun gun gives a target a small electric shock. How a Stun Gun Affects the Human Body? Despite popular belief, stun guns do not have a high number of amps. In fact, the amount of power a stun gun has is not necessarily dependent upon amps. Instead, stun guns rely on volts to shock a target. So, what happens when someone is stun gunned? When someone is stun gunned an electric shock immobilizes them. This is because the electric shock technology used in stun guns target the nervous system. Therefore, instead of a neurological impulse travelling throughout your body, an electric shock does. Stun guns scare people for a variety of reasons. One of the main reasons stun guns scare people is the fact stun guns utilize electricity to shock a target. I know, it can be scary to think that a stun gun literally sends an electric shock through someone’s body. After all, electricity is harmful and could even cause death. But, it’s important to clarify that there is a difference between non-lethal and lethal electricity. Of course, the electricity used in stun guns is non-lethal. In other words, there is enough electricity in stun guns that will cause a target pain. But, there is nowhere near enough voltage for a stun gun to kill someone. It’s also helpful to keep in mind that amps are what kill people not volts, and stun guns have an extremely low number of amps compared to other electric items. Another aspect of stun guns that scares people is the fear of stun gunning themselves. Despite common belief, there is no way you could stun gun yourself unless you turned the pronged head towards your body and pressed it into your body. So, don’t worry about accidentally stun gunning yourself while you’re aiming at your attacker because it can’t and won’t happen. Finally, the last thing that typically concerns people about owning a stun gun is the fact you have to make direct contact with your attacker to stun gun them. Stun guns have essentially no range, which means it requires direct contact to adequately work. While this can be intimidating, it’s helpful to keep in mind that you shouldn’t be worried because you will only make direct contact with your attacker for a few seconds, and during those few seconds you will be stun gunning them. In other words, your attacker won’t be able to harm you. How to Use Your Stun Gun Effectively? Now that you know the basics it’s time to understand how to use your stun gun in three easy steps! Let’s face it: you never know when you’re going to need your stun gun. So, don’t store your stun gun just anywhere. Instead, keep it on you, in your house, or in your car in a place you can easily access. It should also be noted that you should take out your stun gun if you feel like you’re in a sketchy situation. For example, if you’re walking by yourself at night through a ghost town, you should take your stun gun out and keep it in your hand where someone could easily see it. This will most likely stop a potential attacker from attacking you because they will see that you have a self-defense item. And if someone decides to attack you, you will be able to hinder their attempts of an attack within seconds. Since stun guns target muscles, there are certain places that are affected more than others. These are known as target places. Target places are generally areas of the body where there is a large group of muscles, such as your stomach, groin, and thighs. Prior to purchasing a stun gun, feel free to study a diagram of the human body that highlights all of the target areas where you should aim your stun gun. After all, aiming in one of the target areas could hinder your attacker for upwards of 30 minutes instead of 10 minutes. Although your stun gun will hinder your attacker, you don’t want to stay around and wait for safety. Instead, you should escape as soon and as quick as possible after you stun gun your attacker. Prior to escaping, it’s important to quickly observe your surroundings and your attacker. If you have time and feel comfortable enough, quickly snap a picture of your attacker. You should only do this if your attacker is fully on the ground. Once you have a quick mental note of your surroundings and your attacker, run as fast as you can and alert the police.